It's hard to imagine in 2010 the dark shadow of paranoia that enveloped the western world in the late nineteen-forties and fifties. Fear of enslavement by the communist hordes reached levels of hysteria unknown since those jolly old horde-fearing days of Genghis Khan. We all know now that despite having the appearance of great might and resolve the Soviet system was diseased to its core. But, back then, nations like the US, Australia and parts of Europe were so fearful of finding "reds under the bed" that they turned on their own citizens in witch-hunts of appalling ferocity. Today, of course, we have other races, creeds and countries to demonise, but anyone interested in how fragile our democracies can become when hysteria overtakes the rational exchange of ideas about ideology should study the McCarthyist years in detail. What has this got to do with Omega vintage watches, do I hear you say? 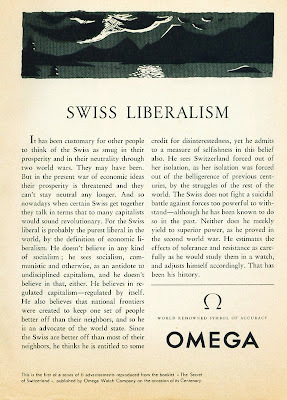 Well, back in the late forties the yanks were giving the Swiss a hard time over their non-partisanship. The logic went that the communist threat was so great that it was basically a crime to sit on the fence. The Swiss, with their record of studied neutrality during two world wars, were on the defensive against the "Either you're with us or against us" rhetoric of the time.......Now where have we heard that recently? Omega and other major Swiss exporters were worried that accusations against the Swiss for the crime of neutrality would damage a lucrative market. And so, the company went on the offensive during its centenary and the years immediately after with a series of beautifully crafted propaganda appeals direct to the American public. Click on the image above to read the text. I'm seeking infomation about my Omega Ladymatic watch from the 1960s. Local jewelers say they can not get parts to repair it. It has been inspected and cleaned. Are parts available for a kinetic movement? Should I just throw the watch away? No, don't throw away - theyre a nice watch. What you need to do is source a non official agent watchmaker who has worked on Omegas over the years, and who may have numerous parts and parts movements in stock. It may take you a while before you get the watch fixed, but it certainly is worth the while. Local jewelers, rather than professional watchmakers, aren't all that interested usually. Also perhaps you could ask for the watch to be opened so you can obtain info on: caliber number, serial number, markings on the case back including case back number. That will make it much easier in identifying the model. The other option, once you've identified the watch is to look on eBay for a cheap facsimile and simply cannibalise the movement for parts. The important thing is to have the watch serviced regularly once its reapired.